First of all, I apologize for the wrinkly nature of the skirt. These pictures were taken post 8-hour workday, so I'm definitely looking... crumpled. Besides the inevitable wrinkles after sitting for hours, I love this Target skirt. It is comfy, the colors are pretty and it is really thick, which is idea for those of us that have... a little bit extra in the back. After work last week, I wore this outfit to my husband's birthday dinner. Things have been so crazy for us the past few weeks, so we decided to celebrate date-night style. We went to eat in a fancy restaurant in the tallest building in OKC. We sat way too high up for my liking, but we got to watch a beautiful sunset and enjoy some time together. Happy Birthday, Eric. You make my life so much more adventurous and beautiful. aw, you look so pretty! So glad you two were able to get away for a little birthday celebration. Happy birthday to your hubs! I'm glad to hear you guys could squeeze in a date night to celebrate! Love the skirt, it's a great color. I really love those Target skirts because the thickness is perfect. But they do wrinkle. I always think its absurd that there are people out there who would judge a wrinkly skirt. Basically you just need to sit down ONE TIME and it happens, get over it people! The green is lovely and looks like you guys had a great dinner out! You went to Vast?! I want to go. How far out did you make reservations? Love that you worked the awesome color of that skirt into your necklace. this is a very cool look! don't feel bad about the wrinkles, i feel like that's the nature of the beast when it comes to pencil skirts. You can see my WIWW at Olivia Cleans Green blog. Every one is raving about those Target pencil skirts. I love the rich emerald shade. You styled it well. And girl your hair looks great here. You are glowing in these photos. Your husband is a lucky guy. Happy Birthday to him! Love love love that skirt and top! I hate the after work wrinkles! You still look great, though! And I love the view! And your hair - it's perfection! I literally spent ten minutes last night trying to get the wrinkles out of a Target skirt. If I didn't teach first thing in the morning, I could peg it on sitting down. I adore the color of this skirt, and love how nicely it plays off of the necklace. Happy belated Birthday to your husband! I need a skirt like that! I really like your blog! I'm a new follower! cruppled or not you look gorgeous! I take all my pictures after work, too so I typically look less than my best. You look great! Your statement necklace is a perfect touch. Sorry for the second comment. I changed the name of my blog, and it messed up my follow button. 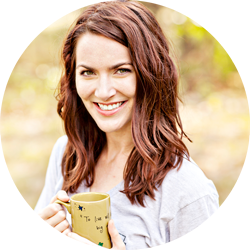 If you want to keep following me, you can go to my page (now named www.whyshesings.blogspot.com ) and re-click the follow button. Thanks! The color of your skirt is so pretty!!!! you look amazing! I love that color green!!! I have been looking for a green skirt & this is exactly what exists in my head! Love how you styled this outfit! I think I could give away all of the shirts in my closet and just keep my chambray shirt and be okay... It literally goes with everything!! Looks beautiful! Happy Birthday to your hubby :) And the power of chambray, literally goes with everything! I really like the color of this skirt! It fits you like a dream too! I haven't tried on a Target pencil skirt in a while. I might have to check them out! I am in love with that necklace...so pretty! 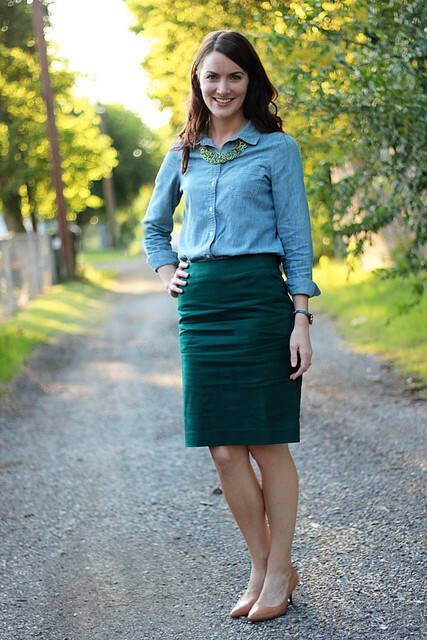 And I love that skirt with your chambray top. I have a similar top and have been trying to find ways to transition it into Fall. I am going to have to check out Target soon! Such a perfect outfit! I love it all, and you are beautiful! I love that statement necklace, it totally elevates the entire look. It's casual chic, and the pictures are gorgeous. I'm so jealous of you guys for having Target!! BTW, you've got a great blog! Would you be interested in following each other? Love it! You look so great in skirts like that! I love that skirt! I'm really into that shade of green for fall! Love this look (even with the wrinkles!) I feel my wrinkles show that I actually wore the outfit (I tell myself these things to make myself feel better...) Pencil skirt and chambray shirt is a perfect combination! Hope your hubby enjoyed his birthday celebration! I love that your skirt looks "worn." It's a fabulous skirt and I love that it's from Target...the color is gorgeous! Ashley, this outfit looks amazing on you!! 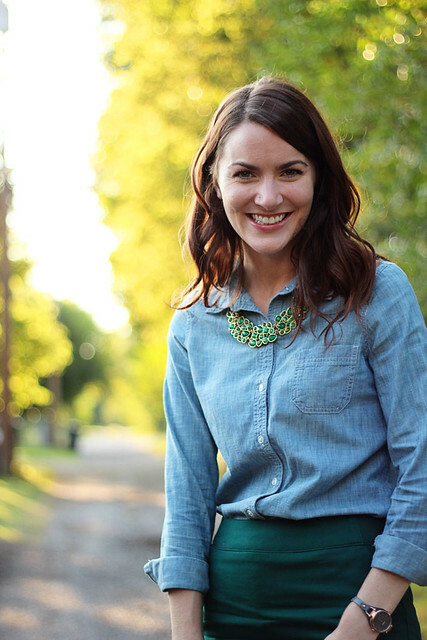 LOVE the statement necklace, your emerald skirt and the whole outfit is stunning. You should put this outfit on repeat because it's adorable!!! Happy birthday!! Wrinkled or not, I love this skirt, the color is just fabulous. Happy birthday to him and you look wonderful! I love your skirt and the necklace. Wrinkled or not, it's a super cute outfit! And what a fun date for a birthday! It's looks like a beautiful view! Happy birthday to ur husband :) Lovely outfit! Happy birthday to your husband. What a lovely outfit. I especially love the colour of the skirt, it is stunning. I am so in love with this outfit! 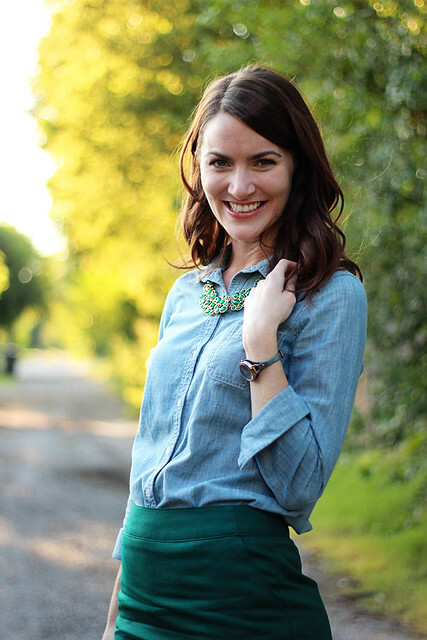 The chambray top and green pencil skirt look fantastic together, and the necklace is such a great piece. So cute! i love that pencil skirt you look so cute!